ELAINE PEACOCK - Singer, Entertainer, Speaker and much more! Elaine Peacock is not just a talented performer and a professional entertainer...she is the real deal. Comfortable with audiences of all sizes, ages and interests, she easily engages the crowd through her spirit, energy and enthusiasm! She delights in walking right down into the audience to shake hands, touch a shoulder, chat with the crowd and share her personal experiences. She touches their hearts with messages of hope and inspiration delivered with sincere conviction. Her unique, personal style encourages audience participation. They will be clapping along, smiling ear to ear and begging for more songs! 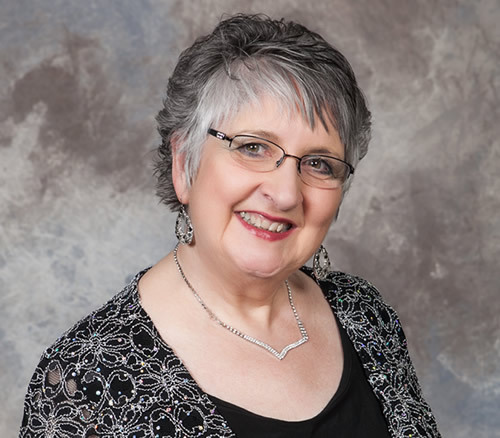 Elaine offers a variety of music -- Country, Gospel, Children's, Christmas, and Patriotic, and you will enjoy her Patsy Cline Tribute show too! She has recorded and released seven CD's - Country Rose Praise, which includes favorite and original gospel hymns; a Patsy Cline Gospel Country; Smiling Down, Everyday is Christmas. Elaine's most recent project, Happiness, Health and Heaven, was recently awarded CD Of The Year by the South Dakota Country Music Hall of Fame! Her project, Spirit of America, features original Gospel, Christmas and Patriotic songs written or published and produced by Nashville Hall of Fame songwriter, Dennis Morgan, who wrote I Was Country When Country Wasn't Cool and George Strait's recent hit River of Love. Dennis selected Elaine after hearing her on a Christian radio station as he was traveling through Sioux City, Iowa in 2005. He called and offered her the opportunity to record his gospel songs, which was one of many answered prayers. An award-winning singer/songwriter and 2009 National Traditional Country Music Hall of Fame & 2010 South Dakota Country Music Hall of Fame Inductee, she has sung at numerous churches, county and state fairs, women's events, city events, Country and Christian music festivals, retreats, receptions, cancer and corporate events. A treat for her is to be joined by her husband, Paul, who sings like Jim Reeves. They team up for a very talented, enjoyable show with a special flair. Elaine is a highly sought after entertainer! Her touring schedule fills up fast so you will want to call her early to book her for your next event! Elaine Peacock has a wonderful ministry. She gives you an evening of enjoyment that only she could provide. Her witness and faith journey are the center of her life. What more could you ask for? What a beautiful hour of music!! My husband and I enjoyed it so much. God Bless You for all you do! Elaine performed at the Brandon Lutheran Church WELCA Advent Brunch on Saturday, December 7th. She was such a delight and great performer. She had the crowd in the palm of her hands, as she sang gospel songs and ended her program with Christmas songs. She really uplifted the group and sent everyone home in a wonderful Christmas mood. Thank you Elaine for being a part of our Advent Brunch and bringing a smile to all of our faces. God has given you such a talent that you are sharing! We loved you! A Christian lady with a lot of talent and love. It radiates out of you, Elaine, when you are singing or just visiting with you. Your strong faith has been a great value in overcoming the cancer, along with all the prayers of your family and friends. Keep up your strength and continue spreading the gospel and lighting up the lives of all your friends who know you, including me. You also see the good in every one you meet. It doesn't matter if they are more unfortunate than you are, and have had really hard lives in the past. You encourage them to do the best they can musically and encourage them to have faith and peace in their lives. You also are a good role model for them to learn to know God as their Lord, through music, and in return can tell others how they came to know the Lord as their Savior. Elaine was a big hit at our barn party. She was so personable and chatted with the crowd like an old friend. She has a wide repertoire of music and we enjoyed the gospel as well as the country. As I looked around, it was fun to see the smiles on the faces of our guests as they tapped their feet to the music. Besides being a great musician, she is a wonderful person and committed Christian. She was a delight to get to know! We can't thank you enough for coming to our North"Western" BBQ & Square Dance and showing us how to square dance! You both did such a wonderful job and helped make this an unforgettable event. We continuously get great feedback, and we have you to thank for that. We are excited to have you back next year. Thanks Again!